The Egyptian Ministry of Foreign Affairs said Saturday it had asked the Turkish ambassador to leave the country, state-run MENA news agency reported. The ministry also recalled its Egyptian envoy from Ankara and stated that diplomatic ties with Turkey will be downgraded, replacing ambassadors with a charge d'affairs. 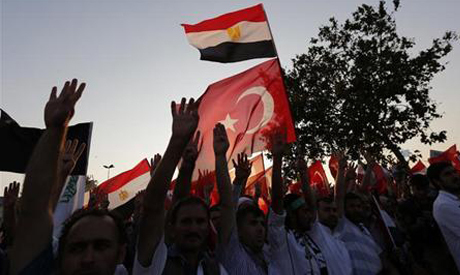 "The people and government of Egypt appreciate the people of Turkey. However, they hold the Turkish government responsible for taking ties between the two nations so far [that] such procedures have to be taken," read the foreign ministry's statement. The ministry accused Turkey of "offending the will of the Egyptian people" through statements "aimed to incite the international community against the interests of Egypt." In response, Turkey's foreign ministry expelled its Egyptian ambassador on Saturday afternoon. Turkish President Abdullah Gul spoke earlier live on state run TRT television saying, "I hope our relations will again get back on track." The conflict between Egypt's interim government and Turkey's Islamic-rooted Justice and Development Party (JDP) arose following the ouster of Mohamed Morsi who struck up a close alliance with Turkey after his election in June 2012. His ouster was fiercly criticised by Turkey's Islamist Prime Minister Recep Tayyip Erdogan, who repeatedly condemned the crackdown on Islamists that followed Morsi's removal from power. Egypt has summoned Turkey's ambassador several times since Morsi's 3 July ouster over Ankara's critical statements on the ruling government in Cairo. Tensions heightened further when both countries cancelled planned joint naval exercises scheduled for October. On 12 November, the Turkish ambassador was summoned after Turkey called for the release of Morsi following his first public appearance in court on 4 November over charges of inciting the murder of protesters. The interim government in Egypt has accused Turkey of "falsifying facts about the situation in Egypt" and "defying the will of the people." Kufr is one nation as so is Islam. So I am a proud Turk. I would rather be under the same shade with Esma vice Sisi in the big Day. The day to decide is today the latest. I used to like Erdogan and rated him quite highly but he has become quite erratic lately making statements that should not be made in the public realm, also leading the secular Turkey down the path of an islamist nation. He has got to big for his boots thinking that he is one of the big boys on the block EGYPT is 100 times greater than Turkey and also has 100 times more potential. AKP need to rethink their leadership or the Turks need to rethink their government. Turkey needs to return to Ataturk's vision. The islamists will destroy a beautiful nation. You communist Nazis and secularists are killing Muslims for stealing every thing from Muslims. From Bosnia to Iraq you Nazis have your finger prints. Thank god that there are countries like Turkey other wise you would have killed all Muslims by now, Its big shame that you support fascists in Egypt. They have done nothing for Egypt, They are going to lose water to Euthopia in few years, they were not able to make Egypt self sufficient in basic needs like food and oil. They are nothing but puppets of foreign countries, they should be punished along with theri allies. I think you have to redo your research. The economy of Turkey is not comparable with that of Egypt. Also in terms of democracy. Egypt is a thirld-world country, while on the on other hand Turkey is a first-world country.